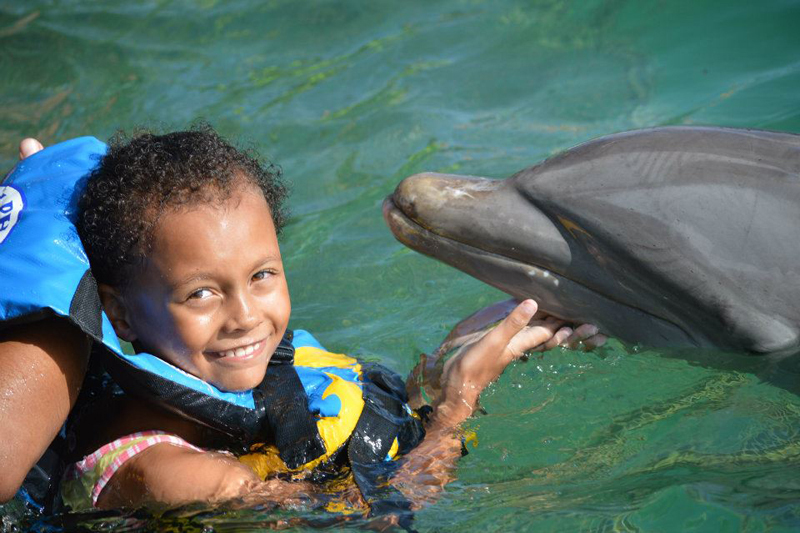 All ages and family members can experience the Dolphin Encounter at our dolphinarium on the Caribbean island of Anguilla. 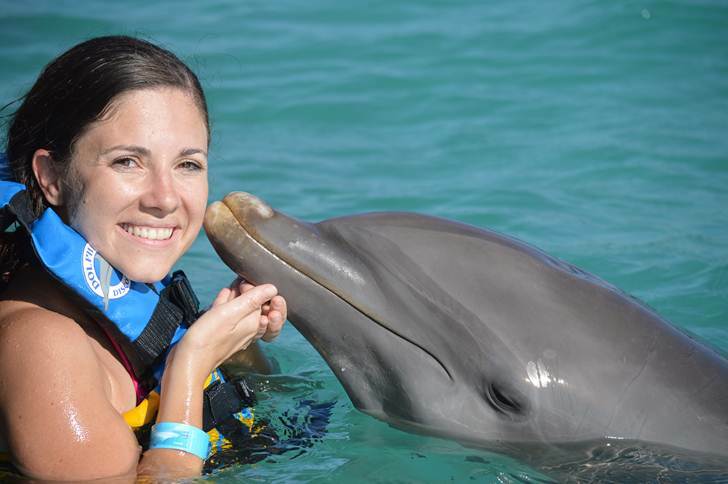 This unforgettable Encounter includes the ferry from St. Martin, and a small-group experience with the amazing dolphins. You will experience dolphin behaviors including kisses and handshakes in their natural habitat. 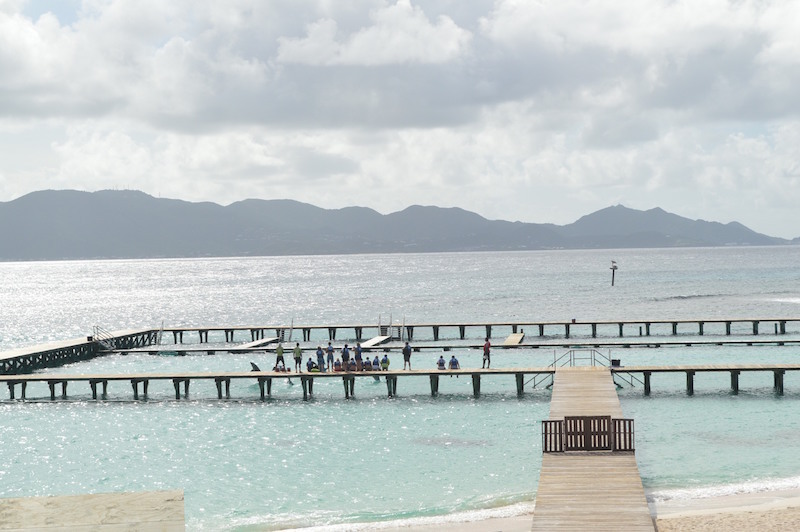 A 20-minute ferry ride from St. Martin to our dolphinarium takes you to this 30-minute Dolphin Encounter tour in the beautiful tropical paradise of Anguilla. The Dolphin Encounter is the perfect way for families with children of all ages to experience the incredible behaviors of these intelligent marine mammals. After a 15-minute orientation, your group will spend 30-minutes with the smart, friendly, and affectionate dolphins. You will experience amazing dolphin behaviors including handshakes, hand target and kisses. 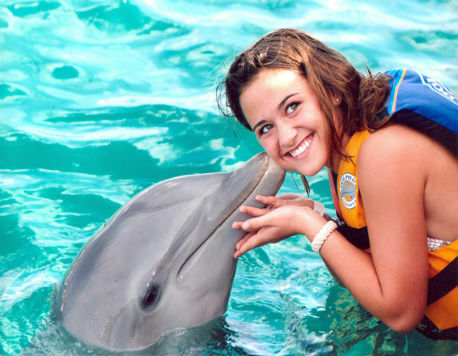 The Dolphin Encounter + Ferry + Transfer package is a small group experience. No more than 20 guests are included, which ensures a wonderful experience for all ages. 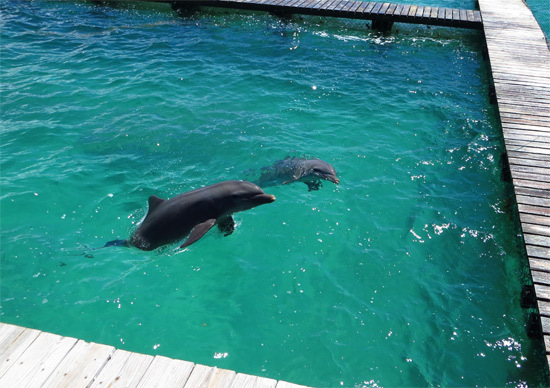 The Dolphin Encounter tour is unique in that it takes place on a submerged platform and easily accessible for everyone. You will also have access to lockers and showers and transportation to and from the ferry. The ferry leaves St. Martin at 9:00 a.m. Monday, Tuesday and Saturday and arrives in Anguilla at approximately 9:45 a.m. While preparing for the trip, don't forget your passport and visa as they may be requested when you arrive on the island. Please contact our call center if anyone in your party has physical disabilities, special needs, or is elderly/pregnant. We are able to accommodate women who are under five months of pregnancy as long as they are accompanied by another adult and have signed a responsibility form. Due to safety concerns, we cannot include those who are further along in their pregnancy. When planning for your Dolphin Encounter at our dolphinarium in Anguilla, don't forget to use proper biodegradable sunscreen, bring towels, and carry cash for any additional activities, such as shopping, dining, or taxis. We welcome you to a unique experience in paradise with the dolphins; so you can form a special bond with these beautiful animals that you will never forget.